Let’s face it – there’s a lot of fashion rules. And I know we talk a lot here about how to push the envelope when those rules are holding you back from being your true authentic self. And this post is no different! There may not be a hashtag yet for the statement sock (or maybe there is? #statementsock where are ya?!) but we are certainly here for this subtle trend. It may seem like totally against the rules to pair sparkly socks with such a classic dress, but we say, “go for it!” This By Timo dress is a floral, ruffle, western, romance all rolled into one beautiful piece. Sometimes a piece that is so specific almost lends itself for even more rule-bending! Next time you’re out shopping, find something super literal and see if there are ways to bring it closer to your personal style. A Gingham dress with lace trim? Add a moto jacket and high top sneakers. A floor-length satin slip dress? Add a patterned long sleeve underneath or a neckerchief. In short, push that evenlope, friends! It’s fashion – nothing is off limits. This entry was posted in Casual Clothes, Get the Look at Minx, Know Your Designers, Local Fashionistas, Party Clothes, Street Style, Vintage Style, What Inspires Us and tagged asheville, Asheville Boutique, asheville boutiques, Asheville NC, Asheville North Carolina, asheville shopping, asheville shopping downtown, asheville street style, Asheville women's clothing, bardot top, Block heel, by timo, floral, floral dress, Minx, Minx Asheville, Minx Boutique, Minx boutique Asheville, off-the-shoulder dress, Patterned Dress, red shoes, ruffle dress, ruffles, socks on September 19, 2018 by minxboutique. 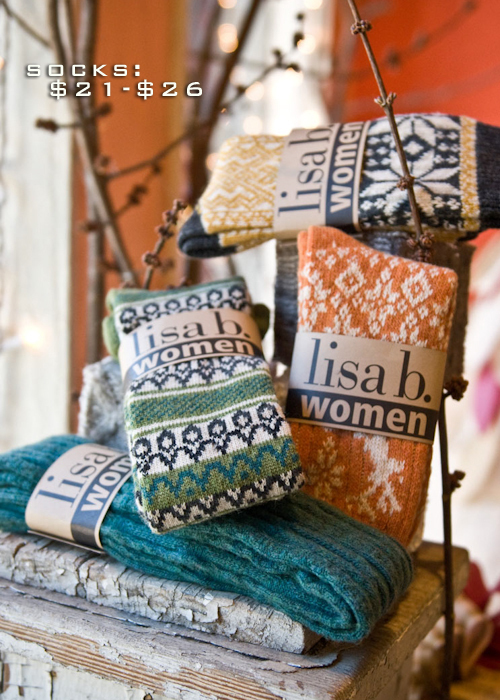 These colorful and cozy socks by b.ella make great stocking stuffers or easy secret santa gifts. Give a pair and show you care by giving the gift of warmth. This entry was posted in Holiday Gift Guide and tagged Asheville Boutique, cashmere socks, easy gift ideas, socks, stocking stuffers on December 4, 2011 by breigh. Don’t let leopards have all the fun, go a little wild and try this strapless spotted maxi dress. Tone it down for the day with a sumptuous shrug by Shae and waist-defining ADA wrap belt. Well-chosen accessories keep it classy. Special thanks to our guest model for the week, Kim Quick; Heather Fisher at Studio Chavarria, hairstyling; and Paola Nazati Photography. This entry was posted in Get the Look at Minx and tagged ADA belt, ashley buchanan necklace, cute socks, grey tall boots, kris nations earrings, leather wrap belt, leopard print, lucky brand, lucky brand boots, pyrite jewelry, Shae knitwear, socks, stovepipe boots, strapless maxi dress, sweater shrug on September 14, 2011 by breigh. Gift Guide – Cozy Socks! A gift for – the Fry boot collector (they look great peeking over the top of pretty boots), the college girl, and honestly… just about anyone! over-the-knee, knee-high and ankle socks, lisa b. This entry was posted in Get the Look at Minx and tagged asheville boutiques, chunky socks, knee socks, lisa b, lisa b socks, over the knee socks, shopping downtown asheville, socks, stocking stuffers, wool socks on December 18, 2010 by minxboutique. Another brilliant boyfriend cardigan for the boys and the girls. We can’t get enough of these slim colorful cords (we also have them in green, garnet, and mustard) tucked into pattered socks and toped off with the very best of warm and cozy. Do yourself… and your man a service and get the last one. Shot in the ever-inspiring confines of Downtown Books and News. 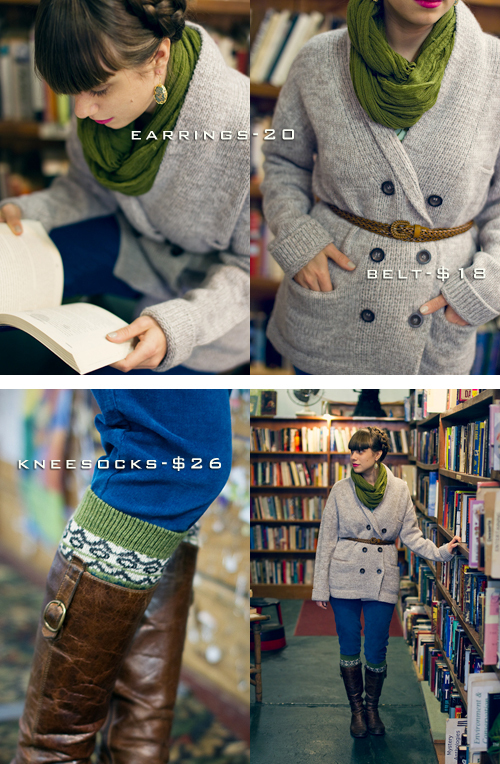 This entry was posted in Get the Look at Minx and tagged Asheville Boutique, blue cords, braided belt, cashmere sweater, corduroy, corduroy jeggings, double belt, downtown books and news, earnest sewn sweater, echo scarf, everyday outfits, lisa b socks, scarf, shopping downtown asheville, skinny belt, socks, unisex sweater on December 6, 2010 by breigh.